NATURE'S OVERLOOK is the Friends’ nature store located in the Visitor Center. 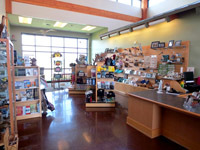 The store features a selection of unique educational, interpretive, and gift items related to the Tualatin River National Wildlife Refuge and the surrounding area. Available are products made by local artisans, logo wear, books, children's items, and many other things that contribute to the enjoyment of nature and a better understanding of the Refuge and its mission. The store also features an area with comfortable chairs, large windows, and a spotting scope for those who want to enjoy the Refuge from inside the building! All proceeds from store sales are used to support projects on the Refuge. Friends of the Refuge members receive a 10% discount. Click the image to go to the shift sign-up site.